1. With Einstein Lead scoring, available at an extra cost, Universities can view the Einstein score on Leads and Contacts. This allows you to make use of the insights helping you reach the right student at the right time. For departments providing Executive Education, Einstein insights help target the right companies, right students and leverage Einstein score to prioritize the right student and win the course. 2. If you send emails using Outlook, it would be ideal to use Lightning for Outlook. This is a much better tool than the Salesforce for Outlook tool. Lightning for Outlook is free and does not involve any desktop installs. It can easily be installed from your Microsoft store. With Winter ’18, admission folks can send emails directly from Outlook using Salesforce email templates, which speeds up the process of sending email in a consistent format..
For Universities using Gmail, Lightning for Gmail has features for admission folks to complete tasks in Gmail, find related records, such as applications, easily. If you are a Pardot user and use Salesforce, campaign influence is a feature which should be leveraged effectively. With Winter ’18, you are getting 3 new models, namely first touch, last touch and event distribution model. Using these models, Universities can track which campaigns work effectively for their prospective students and also help distribute campaigns across multiple touch points on drip campaigns. 2. If you are using Pardot Engage, Lightning for Outlook now displays Pardot score and Engagement history is visible right in your Outlook tool. This helps the admission folks send the right message to the student based on the recent engagement. Community on boarding for Students. With the latest marketing cloud beta feature, you can easily integrate journey builder with communities. This helps Universities on-board your newly registered students. If you have international students, this feature helps send on-boarding emails to international students. 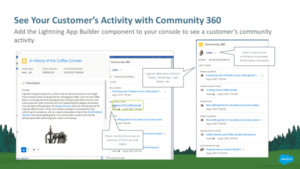 If you are using communities for your student portals, Winter ’18 brings the community 360 feature which is in GA. This feature helps you see in one place your student activity across multiple communities, questions asked, posts and articles they viewed. This allows you to have a meaningful conversation with prospective students easily. Winter ’18 feature provides pre-defined community reports which allows you to monitor engagement with the new student members and easily communicate with them in one view. With Winter ’18, you can create custom login, registration and main pages based on users location and region. This would be a handy feature for handling international students and have a unique registration and login experience for them. For Universities who are using one stop service center using service cloud, Winter ’18 brings a new service crew feature. With this feature, you can create a team to manage your services and assign them a work order to manage student issues. 2. If you are using field service lightning, Universities can assign resources for complex work which has multiple dependencies easily. This would help with project management and shceduling complex appointments easily. 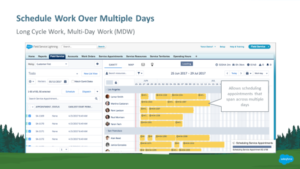 You can schedule work over multiple days using the new winter 18 feature. With Winter ’18, you can encrypt more fields on leads, accounts and contacts which helps meet your compliance needs. This is in GA. If you want to monitor what users search for in your Salesforce org, Winter ’18 now has search events available on the event log file. This is a feature Universities should utilize to monitor report downloads, find most frequently used searches which would help increase adoption. 2. Monitor frequently used articles on your service center. Winter ’18 also allows knowledge article views which would help in viewing most used articles. This helps identify content strategies for your community users and help them find content easily, saving time. Integrate real time with SIS, HR systems. The new Change Data Capture (Beta) feature allows you to send real time data using messaging. Universities can send real time data on students and application updates in Salesforce using enterprise messaging. If you have developers who have built messaging systems, this feature allows them to utilize it easily. If you have Microsoft developers, there is a new open source visual studio plugin which allows developers to build apex, visual force and lightning components. Here is the link to download it. With the new Salesforce DX, developers can easily build scratch orgs which will allow developers to build features in an org quickly without any dependency, build continuous integration and test changes automatically. 4. Big object support for millions of records. Winter 18 brings a new object Big object which allows to store millions of records. This would allow universities to store all student data from SIS systems like banner, people soft and also allow to process them quickly. With the new bulk API 2.0, users can upload large files with an easy import process and have batch jobs process them in parallel. I would advise Universities to use these features to save time and increase enrollment. Please feel free to post your comments and email me at buyan@eigenx.com for future questions.